Road and Strip Performance Calculator for your iPhone or iPad And while perhaps obvious, if you change from an iOS device to a non-iOS device, you WILL need to buy a new license as they are incompatible. Great for: Bracket Racers, Hot Rod Owners, Engine Builders, Car and Truck Enthusiasts, Bench Racers. Low introductory pricing! • Predict Elapsed Time and Speed, Using Motorsport Standard Atmosphere Corrections • Calculate how current track conditions will affect your car's performance • Full User's Guide built in as well as ability to press and hold a key for specific help ET Prediction calculator with built-in motor building and performance solutions will give you the competitive edge at the track or in the garage, without having to remember complex formulas or look them up in tables or charts. At the track racers can see how weather and elevation will affect their times so they can instantly predict dial-ins using current track conditions. In the garage, engine builders and tuners can easily see how changes in a car's engine and fuel system will affect performance and solve dozens of "what if" scenarios in seconds. It helps you: • Calculate Engine Displacement in cubic inches, liters or cc’s • Improve your engine’s air-fuel efficiency • Calculate how changes in tire size affect gear ratio and speedometer • Easily calculate fluid conversions for gallons, fluid ounces, cc, ml, liters, temperature conversions for Celsius and Fahrenheit, weight conversions, metric and imperial • Automatically calculate Brake Horsepower given Torque and RPM, or ET and Vehicle Weight, or MPH and Vehicle Weight BUILT-IN SOLUTIONS • Predict Elapsed Time and trap speed for 1/4 mile and 1/8 mile runs • Automatically calculate Brake HP given Torque and RPM, ET and Weight or MPH and Weight. 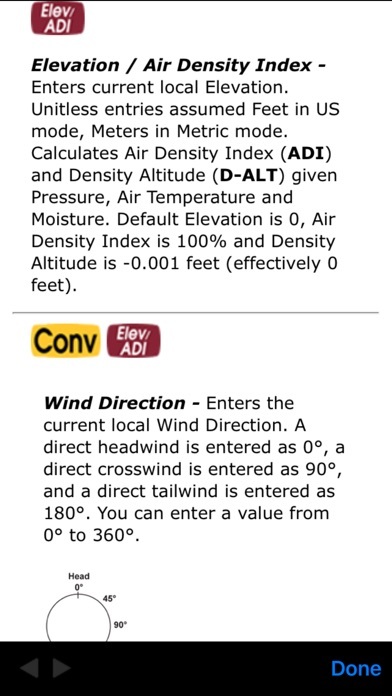 • Enter or calculate local track conditions, including Absolute Pressure, Air Temperature, Moisture, Elevation, Air Density Index and Density altitude, Wind Speed and Direction and predict their effects on your ET and speed. 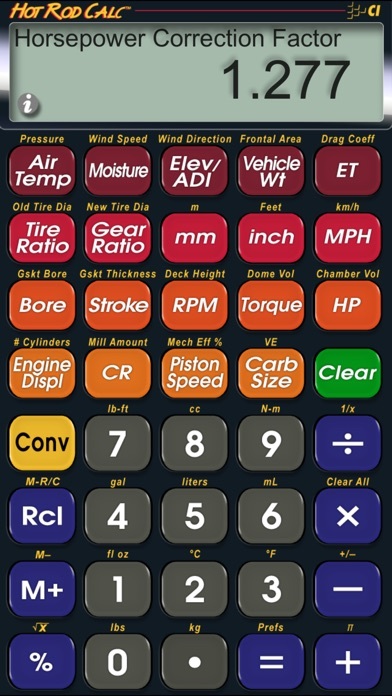 • Calculate speed given Vehicle Weight and HP or Tire Diameter, Gear Ratio and RPM. • Instantly see how changes to any of 8 engine measurements can increase your Compression Ratio -- deck height, dome volume, chamber volume, gasket thickness, gasket bore, bore and stroke and/or milling the heads. • Enter target Engine Displacement and current Stroke to calculate the new Bore or enter displacement and current Bore to calculate new Stroke. 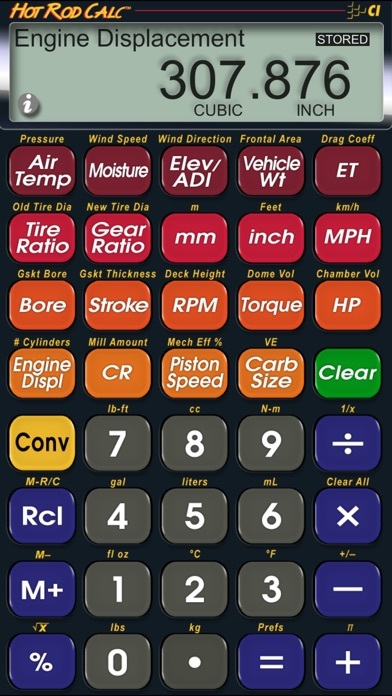 ADDITIONAL FEATURES • Fluid conversions for gallons, fluid ounces, cc, ml, liters, temperature conversions for Fahrenheit and Celsius, weight conversions, metric and imperial conversions. 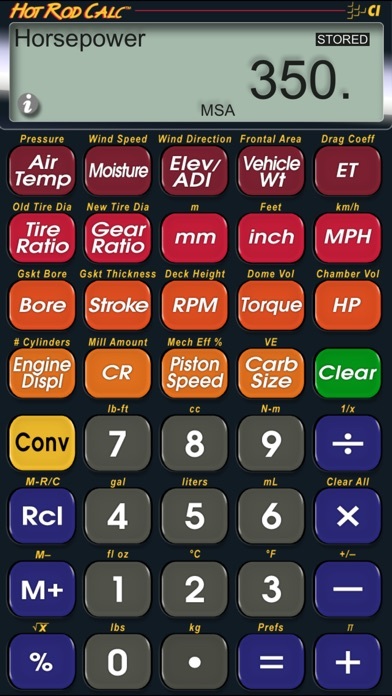 • Calibrate the calculator's Mechanical Efficiency setting to more closely match a car's time. •Calculate fuel correction index to determine new jet flow requirements. • Built-in help, including Holley® jet specs – just press and hold the desired key for full, clear definitions, explanations and examples of keystrokes.